We just had an interesting mid-plate earthquake (not along a plate boundary). Hat Tip to Jascha Polet, who pointed out this is in the region of the 1998 M 8.1 earthquake, one of the largest strike-slip and mid-plate earthquakes ever recorded. I then learned that the seismicity in this region may be related to isostatic adjustments in the Antarctic plate! Here is the USGS website for this M 5.9 strike-slip earthquake. Here is my interpretive map. I plot the USGS location as a yellow star. I also include some other figures as insets. I will discuss these below. 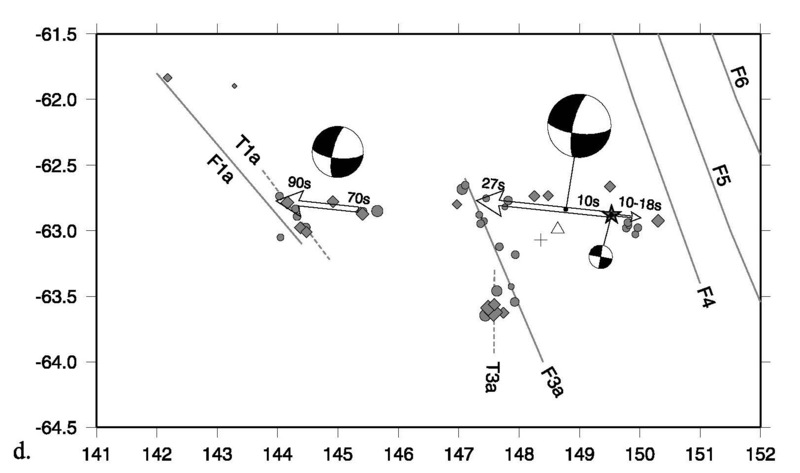 I include a figure from Kreemer and Holt (2000) that shows focal mechanisms for earthquakes in the region plotted on a bathymetric map (seafloor topography). I also include a few maps from Das and Henry (2003). About a week ago, there was an earthquake along the Australia-Pacific plate boundary to the northeast of this earthquake (here is the Earthquake Report for that earthquake). Here is the earthquake report interpretive poster for the recent earthquake to the northeast. Here is the Kreemer and Holt (2000) figure 1, showing the focal mechanisms for earthquakes along the regional plate boundary faults, as well as the focal mechanisms from the earthquakes in the region of the 1998 M 8.1 earthquake. I include their figure caption below in blockquote. Focal mechanisms are from the Harvard CMT catalog (1/77-6/99). The black focal mechanisms indicate the 1998 Antarctic plate event with (some of) its aftershocks. Bathymetry is from Smith and Sandwell . Transform locations are derived from satellite altimetry by Spitzak and DeMets . MRC is the Macquarie Ridge Complex and TJ is the Australia-Pacific- Antarctica triple junction. Here is the first figure from Das and Henry (2003). They plot the epicenters and focal mechanisms for earthquakes from the 1998 swarm overlain upon the gravity anomaly map. I include their figure caption below in blockquote. The 25 March 1998 Antarctic plate earthquake (with a seismic moment of 1.3  1021 N m). (a) Relocated aftershocks [Henry et al., 2000] for the period 25 March 1998 to 25 March 1999 are shown as diamonds, with the main shock epicenter shown by a star. Only those earthquakes which are located with the semimajor axis of the 90% confidence ellipse 20 km are shown. 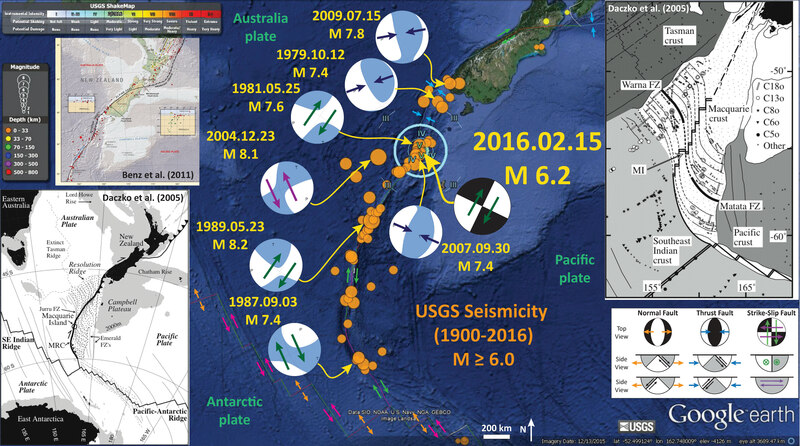 International Seismological Centre epicenters for the period 1 January 1964 to 31 July 1997 are shown as circles. Marine gravity anomalies from an updated version of Sandwell and Smith , illuminated from the east, with contours every 20 mGal, are shown in the background in the epicentral region. Selected linear gravity features are identified by white lines and are labeled F1–F6. F1, F2, and their southward continuation to join F1a compose the George V fracture zone. 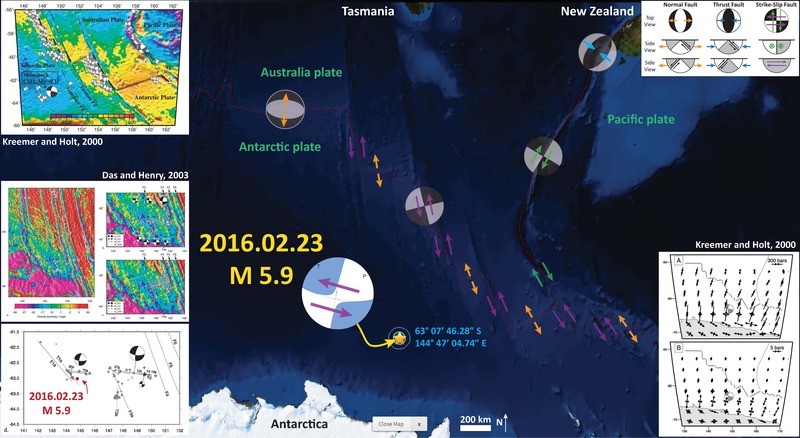 F4–F6 compose the Tasman fracture zone. (b) An expanded view of the region of the aftershocks. The relocated aftershocks in the first 24 hours are shown as diamonds; the rest are shown as circles. The 90% confidence ellipses are plotted for the locations; earthquakes without confidence ellipses were not successfully relocated and are plotted at the National Earthquake Information Center (NEIC) locations. The yellow star shows the NEIC epicenter for the main shock, with the CMT mechanism of solution 5 from Henry et al. . Available Harvard CMT solutions for the aftershocks are plotted, linked with lines to their centroid locations and then to their relocated epicenters, and are identified by their dates (mmddyy). The location of the linear features identified on Figure 6a are shown by black arrows. (c) Final distribution of moment release for preferred solution 8 of Henry et al. . There are the same gravity anomalies, same linear features, and same epicenters as Figure 6b except that now only earthquakes which are located with the semimajor axis of the 90% confidence ellipse 20 km are shown. Two isochrons from Mu¨ller et al. are plotted as white lines. Superimposed graph shows the final moment density, with a peak density of 1.25  1019 N m km 1. Regions of the fault with 15% of this maximum value are excluded in this plot. The baseline of the graph is the physical location of the fault. The spatial and temporal grid sizes used in the inversion for the slip were 5 km 5 km and 3 s, respectively. since 1977, and at the time the fifth largest of any type worldwide since 1977” (Das and Henry, 2003). This M 8.1 earthquake was interesting because it crossed the fracture zones that trend N-S in the area. This is especially interesting because this is also what happened during the 2012 Sumatra Outer Rise earthquakes. Toda and Stein (2000) model the coulomb stress changes associated with different slip models from the M 8.1 earthquake to estimate if the aftershocks were triggered by the main earthquake. I include their figure caption below in blockquote. Here is the Kreemer and Holt (2000) figure that shows their interpretation of the stress field. The first figure below shows their determination of the strain rates as modeled from tectonic stresses at the plate boundaries. Note the low strain rate in the area near the M 8.1 earthquake (plotted as a focal mechanism). The second figure below shows the averaged minimum horiztonal deviatoric stress field caused by by flexure in the crust following the last ice age. Based upon their analyses, they attribute the earthquake to possibly be the result of stresses in the Antarctic plate following the last deglaciation. I include their figure caption below in blockquote. region are one order of magnitude lower than along the surrounding ridges and transforms. 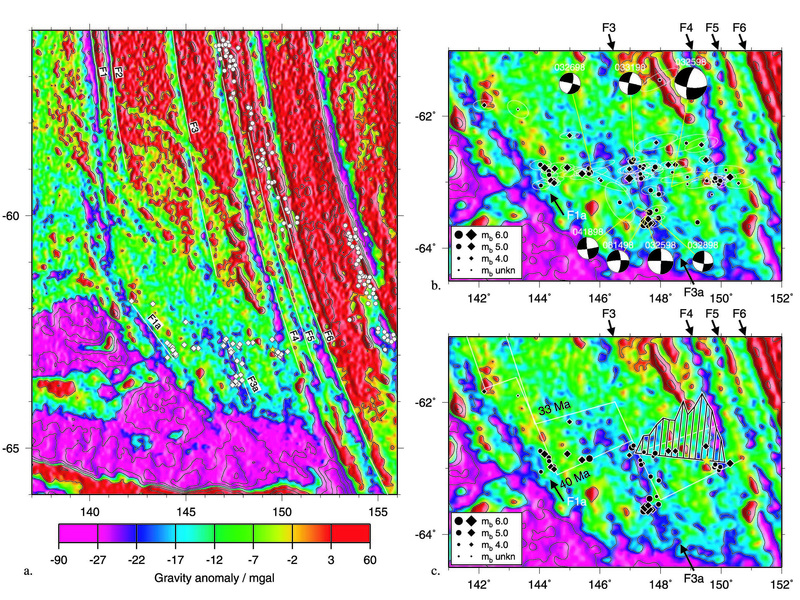 Principal axes of the vertically averaged minimum horizontal deviatoric stress field caused by gravitational potential energy differences within the lithosphere. CMT focal mechanism of Antarctic plate earthquake is shown. a) ‘ice-age’ simulation. b) change in stress tensor field from ‘ice-age’ to present day determined by taking the tensorial difference between the two solutions.